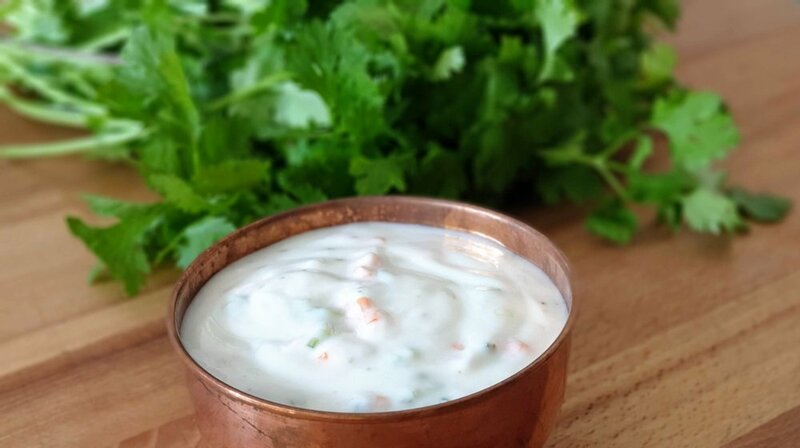 This yogurt condiment is perfectly paired with any meat or rice-based dish such as my easy chicken biryani, my Aromatic rice with chicken Madhabi, maqloubeh, Indian style kafta or with kafta arayes. * In a fry pan dry toast the cumin seeds foe 20 seconds until the aroma is released. * Crush the seeds in a pestle and mortar. * Whip the yogurt in a bowl along with all the ingredients, adjust the salt and serve cold. Per Serving: 369 Calories; 9g Fat (22.3% calories from fat); 29g Protein; 44g Carbohydrate; 2g Dietary Fiber; 30mg Cholesterol; 378mg Sodium.